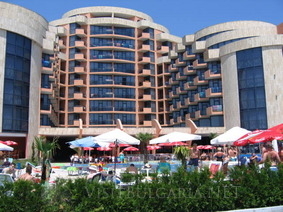 Fiesta M hotel in Sunny Beach Black Sea resort in Bulgaria. - 10% discount until 15 April 2018. - 7=6, 14=12, 21=18 for arrivals during the periods: 15 May - 14 June 2018; 06 Sept - 10 Oct 2018. Location: Fiesta M hotel is located on the very beach in the northern part of Sunny Beach. Accommodation: The hotel offers 96 double rooms and 32 Junior suites with telephone, sat TV, Internet access (WiFi/FOC), mini-bar, bathroom with shower and hairdryer, balcony. Bars and Restaurants: Main restaurant with Bulgarian and international cuisine, serving buffet breakfast and dinner, lobby bar, bar, room service. The restaurant offers 200 seats in two halls and 80 seats on a panoramic terrace, show cooking and live music. Facilities: Number of storeys -10, Elevator - 2, Safe at the reception (3,5 Ђ per day), Internet cafe (Ђ), Wi-Fi, Сredit cards, Currency exchange, Disabled friendly, Rent-a-car, Parking (free of charge), Secured area, Park area and Gardens. Sports and Wellness: Outdoor swimming pool, table tennis, billiards, massage, hairdressing salon. For children: Children's section of main pool, Baby cot (6 Ђ per day), Children's room.